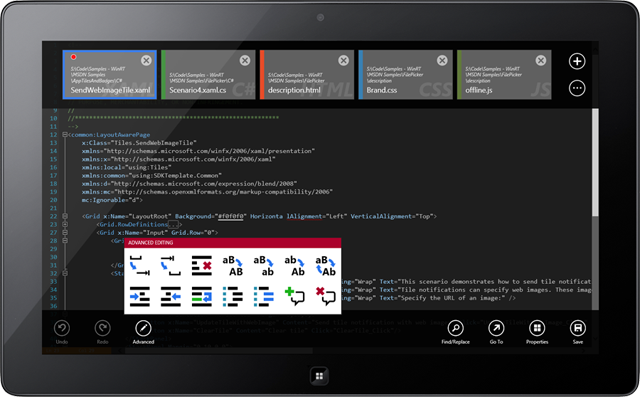 We just published v1.6 of Code Writer, our free text/code editor app, to the Windows Store. This version adds new advanced editing functionality for the XML and XAML file types, and further improves upon touch interaction. Code outlining (folding) - Lets you expand/collapse block elements via the new outlining margin. End tag auto-complete - When completing a start tag, the appropriate end tag will be inserted. 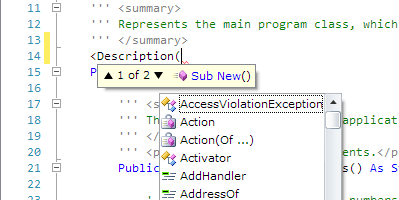 Quick info - Show when hovering over a tag or attribute, and give more information about the namespace and hierarchy. Smart indent - Moves the caret to the appropriate indent level after Enter is pressed. Syntax error reporting - Places red squiggle lines under syntax errors. Hover over them to get more information. Text formatting - Makes the code more readable by formatting it. These new features will increase XML/XAML file editing productivity dramatically! Trim all trailing whitespace - Removes all whitespace at the end of any line. Format document - Formats the entire document (only available for languages that support text formatting). Format selection - Formats the selected text (only available for languages that support text formatting). This new version automatically hides the line number and outlining margins when Code Writer enters snapped view. This allows the limited screen real estate to be maximized for the code itself. The touch-based selection grippers have been adjusted and enhanced based on usability testing. Also numerous performance optimizations have been made to the core editor itself to improve the editing experience. With the latest advanced editing features for XML/XAML, Code Writer is quickly becoming a go-to app for these file types. Go to the Windows Store to download it, and help us by tweeting about the app! Actipro WPF Controls 2013.1 have been released and is now available for download. This version adds a new full-size Charts product, a Metro Dark theme, a complete reimagining of the Sample Browser's UI, and some great new SyntaxEditor functionality. Major new features are described below. See the announcement post for the detailed list of enhancements and updates. Our new full-size Charts product has been added, allowing you to create stunning charts for your apps. See this announcement post and this first look post for a couple other chart screenshots. 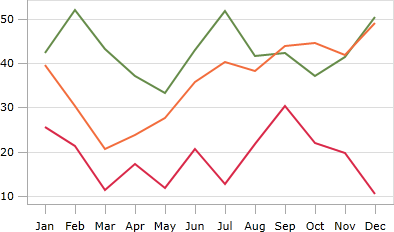 A line chart renders quantitative data as a series of points connected by line segments. Lines can be straight, curved, or stepped. Markers can optionally be displayed based on type (such as first/last, high/low, negative, etc.). 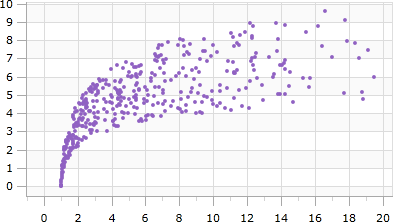 Scatter charts render data points where each point is represented by a marker. Markers can use numerous built-in shapes or can be set to use custom shapes. 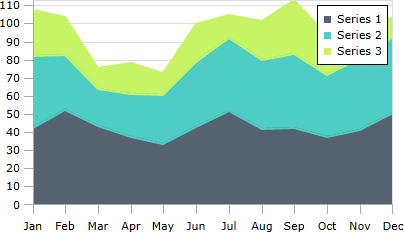 A bar chart displays rectangular bars with lengths proportional to the values they represent. Bar spacing can be set and the bars can be changed to render horizontally instead. A rich object model for supporting indicators has been added. Indicators are special "tagged" regions of text that optionally display a glyph in the indicator margin and optionally highlight the text range with special styles. Built-in indicators include bookmarks, breakpoints, and current statement indicators. Custom indicators can easily be created as well. See this bookmark indictors post and this debugging indicators post for much more detail on indicators and examples of functionality. When a style that has a background encompasses a line terminator, it now will render the background of the line terminator's virtual character. A new property BackgroundSpansVirtualSpace property has been added to highlighting styles that when set to true, will extend the background over a line terminator to cover all the way to the right edge of the view. A new edit action has been added to trim all trailing whitespace in the entire document, regardless of the current selection. The CollectionTagger<T> class has received a large number of new methods that make it easier than ever to manage a collection of tagged regions. Text formatters have been added to the C# and VB languages in the .NET Languages Add-on, which beautify code by adjusting whitespace and making it more readable. See this C# text formatter post and this VB text formatter post for more information and examples of the formatting results. 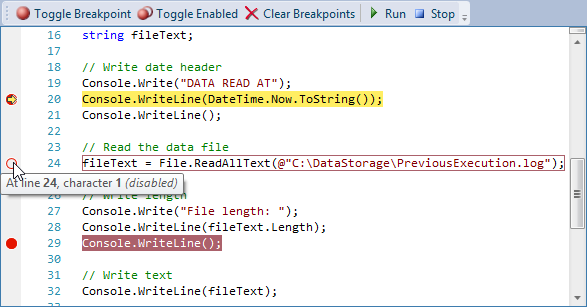 Full automated IntelliPrompt while editing C# and VB attributes is now included. Automated IntelliPrompt quick info now displays when hovering over var in C# or Dim in VB. See this blog post for some more information and screenshots. 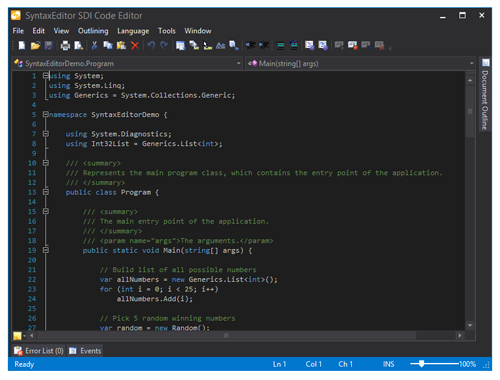 A Metro Dark theme has been implemented that renders similar to Visual Studio 2012's dark theme. This new theme affects all controls and even can apply to native WPF controls. Actipro Themes for WPF now provides implementations of all system themes, three Office themes, and three Metro themes! See this blog post showing several screenshots of the new Metro Dark theme in action. Actipro Silverlight Controls 2013.1 has been released and is now available for download. This version adds a new full-size Charts product, a complete reimagining of the Sample Browser's UI, and some great new SyntaxEditor functionality. Note: Version 2013.1 updates the Silverlight controls to target the Silverlight 5 platform. SyntaxEditor's text rendering has been updated to support Silverlight 5's TextOptions.TextFormattingMode property setting. This feature allows for improved text clarity. Today we published new maintenance releases of our WPF control products. The maintenance release contains numerous tweaks and bug fixes across the various WPF control products. It is highly recommended that if you are on v2012.2, you download and switch to this new build. See the announcement post for the detailed list of enhancements and updates. We are finishing up and doing a final review of v2013.1 now. We hope to publish it next week! We've just about wrapped everything up for the 2013.1 versions of our WPF, Silverlight, and WinRT/XAML controls and hope to have them out next week. As mentioned in a previous post, this new version introduces a new full-size Charts product to complement our existing Micro Charts controls product. 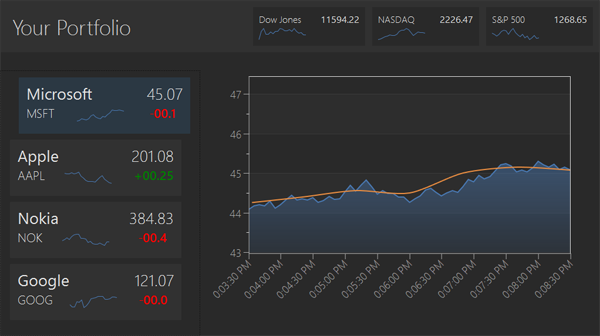 This demo shows a simulated financial dashboard where the charted values refresh and scroll every few seconds. You can click on a stock on the left side to view its detail in the large chart on the right. 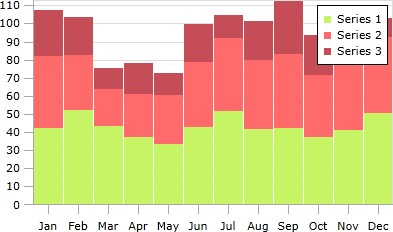 The new Charts product, this sample, and many more QuickStarts are coming soon in the 2013.1 version!